Content is an insatiable beast. Demands are ever changing. As with most things, what worked yesterday is replaced by something that provides more value today. At ArchVision we think of content in terms of flow, not something that’s static. While we continue to add new RPCs to your subscription plan we realize it is never enough. Though we try, it’s an impossible task to satisfy the thousands of unique needs of our customers across the globe. In order to best service and satisfy those varied needs we began investing in opening up the RPC Platform to encourage others to participate. We’ve always encouraged support for RPC content in the leading applications. The success of RPC begins and ends with broad support in what we call the “host” applications; the software you find critical to your daily workflow. Today you can use RPC content in 3ds Max, Autocad, Revit, Microstation, Rhino, FormZ, Modo, Photoshop and with the leading rendering solutions like V-Ray and Accurender. There’s rumor something might be in the works for SketchUp as well. Check out labs.archvision.com for more info. Support for RPC in the host apps doesn’t quell the content appetite. We had to open RPC to anyone who wanted to take advantage of the tightly integrated workflow. We started this process several years ago by moving to a subscription business model. This allowed us to truly think of RPC content as a never ending flow available to subscribers and to look for others who may have content that could be delivered most effectively via RPC. Last year we released a new and improved RPC Creator tool integrated with the ArchVision Dashboard. RPC Creator lets anyone drag and drop a PNG or TIFF formatted image onto Dashboard and instantly create an RPC. That ease of creating RPCs has brought thousands of new RPCs into existence over the past year. As part of this initiative we were pleased to announce our first RPC Publishing partner, 3dRender, and the availability of their popular Pro-Viz People textures in the RPC format. We’ll be announcing additional partners in the coming months. So now that we’ve got you making RPCs what’s the next logical step? We believe many of you will be willing to share the RPCs you’ve been making with the new RPC Creator tool. If every matted PNG or TIFF image could be converted to RPC it’s more likely you’ll be able to find just the right content to satisfy your needs. So we’ve started an experiment we call Stash!. Stash! is a repository of RPCs you’ve created and offered to share with the community of RPC users around the world. It’s not fancy (yet) but gets the job done. All you need to do is hit the “Submit to Stash!” button and upload your Custom RPC. We’ll test the RPC and post your submission to Stash! to share with everyone. If you haven’t visited Stash! you should check out some of the content your colleagues have contributed and add them to your collection. Better yet, if you’ve made something you think others would enjoy make your own contribution to Stash! Filed under General Tips & Tricks, Innovations + Observations, Products Tagged with archvision, Content, content management, create, RPC, RPC Creator, rpcs, Stash! ArchVision (Lexington, Kentucky USA) and 3dRender (Sheffield, UK) are pleased to announce a new partnership. Effective immediately 3dRender’s Pro-Viz People collections now include RPC versions of the content. The Pro-Viz People collections make available 500 high quality people textures as PNG, JPEG and now RPC, perfect for enhancing architectural renderings. As RPC, users will experience a much simplified workflow in Revit, 3ds Max, Autocad, Microstation, FormZ, Rhino, Modo and Photoshop. RPC enables one-click placement and drag & drop into select applications simplifying the workflow by removing the tedious process of creating native geometry and materials traditionally needed to get PNG & JPEG formatted textures into 3d models. The RPC platform not only enables dramatically simplified workflows for placing and managing architectural entourage in 3d models but also provides search & tagging of content inside ArchVision Dashboard, mass editing and placement tools, cloud rendering support and new non-photorealistic stylization of content inside Autodesk Revit via Entourage Workshop. The Pro-Viz RPCs will appear, pre-tagged, within ArchVision Dashboard for ease of organization and search. “Publishing our extensive architectural texture collections as RPC makes our customers investment more valuable. Features such as ArchVision’s new Entourage Workshop for Revit bring an entirely new capability to our collections” said Tim Barrett, Owner at 3dRender Ltd.
Use of the RPC platform requires a separate license available at archvision.com. The Pro-Viz collections including the new RPC format are available for purchase at 3dRender.co.uk and at archvision.com. ArchVision’s mission is to improve design modeling and visualization with content and content management software solutions. We do that in several ways. Our RPC (Rich Photorealistic Content) technology provides render-friendly, image-based architectural entourage primarily in the form of people, tree & plant, and automobile content to customers around the world. RPC was selected by Autodesk as the default tree & planting solution that ships with Revit. ArchVision’s Dashboard content management platform provides content organization and search tools for managing vast amounts of design content as well as plug-in and license management. RPC has become the defacto-standard solution for managing architectural entourage with support for the leading modeling and visualization platforms and solutions including Autodesk Autocad, Autodesk Revit, Autodesk 3ds Max, Bentley Microstation, Robert McNeel & Associates Rhino 3D, The Foundry Modo, Autodessys FormZ, Chaos Group V-Ray, Accurender nXT and Adobe Photoshop. For additional company or product information or to inquire about the RPC SDK, contact ArchVision at +1 859.252.3118 or email support@archvision.com. 3dRender Ltd is the creator and distributor of Pro-Viz(TM) 3D texture and image entourage products, designed specifically for use in high-end architectural visualization. Our Pro-Viz(TM) products are used by thousands of CG artists worldwide, along with many of the industry’s leading architects and visualization studios, including Foster+Partners, Red-Vertex, Atkins Global, WZMH Architects, VisualWorks, LAUBlab KG (the creators of VRAYforC4D) & many others. LHB is dedicated to being environmentally responsible, reducing long term operating costs, and improving the quality of life for their clients. This is true even when they are their own clients. 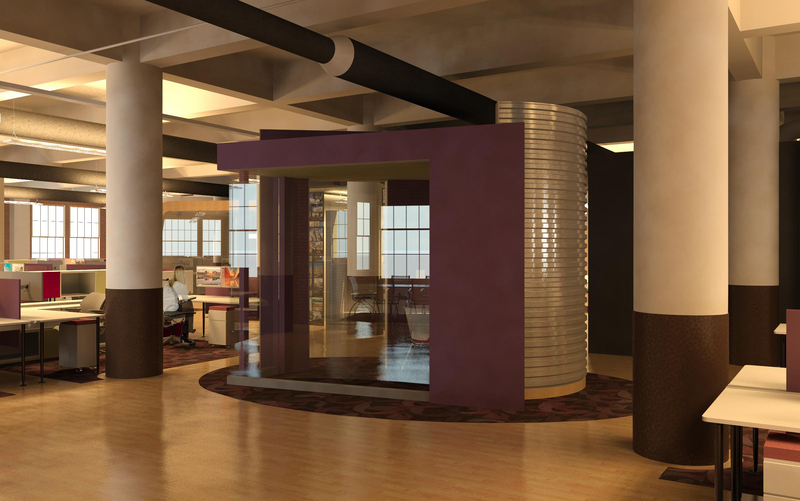 LHB is pursuing LEED® CI Platinum certification for their Minneapolis office. 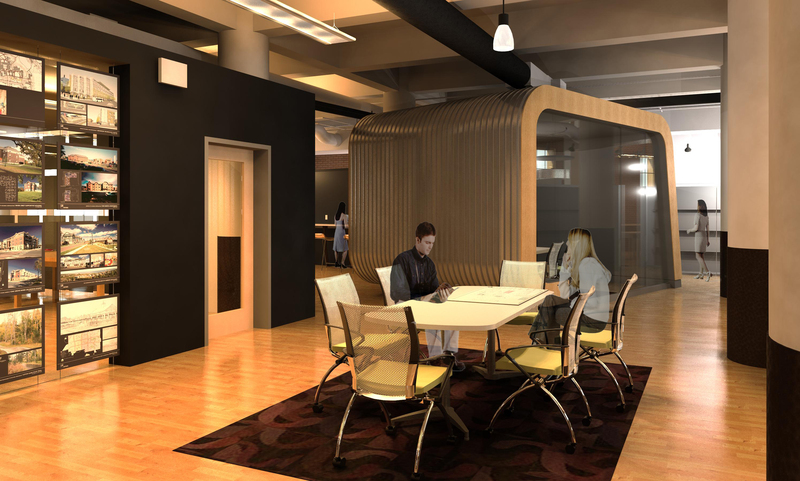 In this project, RPC Content helps communicate the size and the new collaborative environment the Minneapolis LHB offices offer. The design features of the space, such as overhead fabric ductwork and LED lighting, are part of an effort to gain Leadership in Energy and Environment Design (LEED) Platinum designation for commercial interiors from the U.S. Green Building Council. We always enjoy seeing customer projects and how they utilize RPC Content. 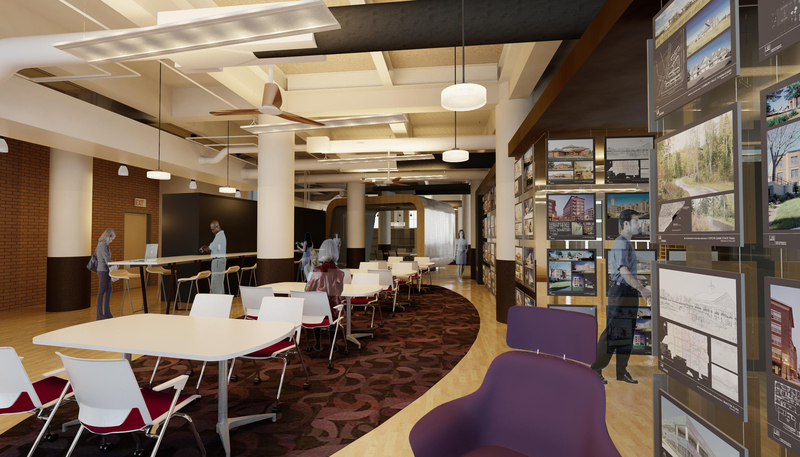 In this project, renderings were completed in Revit. ArchVision RPC Content was ‘ghosted’ in Photoshop and then merged into the Revit scene for final output. Project design by Bruce Cornwall, models by Nick Vreeland, and renderings by Daniel Stine. For tutorials on RPC lighting and techniques, please visit our help site. To see how to place RPC Content into Revit scenes, view our video tutorials. Get started using RPC Content, download ArchVision Dashboard here. LHB ranked as one of the top engineering and architectural firms in the nation by Engineering News-Record (ENR), Architectural Record, and as a 2013 Hot Firm by ZweigWhite. LHB ranked No. 381, up from No. 463 two years ago, in the ENR Top 500 Design Firms List. In addition, LHB placed No. 249 on Architectural Record’s Top 300 Architecture Firms List, and No. 45 on The Zweig Letter Hot Firm List. Want to see your firm featured? Designed with new and experienced users in mind, V-Ray 3.0 offers a simplified user interface with fast access to common settings. Render set up is now faster and easier with V-Ray 3.0’s Quick Settings. Artists can choose from a variety of production presets and fine tune quality with slider controls. And a new V-Ray Toolbar puts all popular V-Ray tools in one place. Optimizations to V-Ray’s ray tracing core make rendering in V-Ray 3.0 significantly faster. Depending on scene complexity beta users are reporting speed increases up to 5X. Using a powerful path-tracing engine, V-Ray 3.0’s new Progressive Image Sampler delivers instant feedback to artists and makes look development faster and more intuitive. An improved V-Ray Frame Buffer adds Lens Effects and advanced color corrections for Contrast, HSL, and Color Balance. New tools designed to give artists more control and flexibility include Max Ray Intensity, Probabilistic Light Sampling, Reflection/Refraction Trace Sets, and Render Mask to specify exact render regions with an object selection or image mask. Support for open source tools and formats include Alembic 1.5, Deep Images and OpenEXR 2.0, programmable OSL shaders, and advanced color management with OpenColorIO. • Universal render nodes to be used across multiple 3D platforms (V-Ray 3.0 for 3ds Max and Maya will be the first tools to support the universal render nodes). • Workstation Licenses to reduce the cost for an individual user license. Workstation and Bundle Licenses available here. We can provide quotes to you for your studio, assist with set-up planning and help you determine what will best meet your needs. Contact us at support@archvision.com or call us Monday – Friday, 9am-5pm ET, +1 859.252.3118 ext 117. Join us tomorrow December 12, 2013, 2:00 pm EST for a live webinar – Rendering RPCs in RaaS. We’ll show just how easy it is! 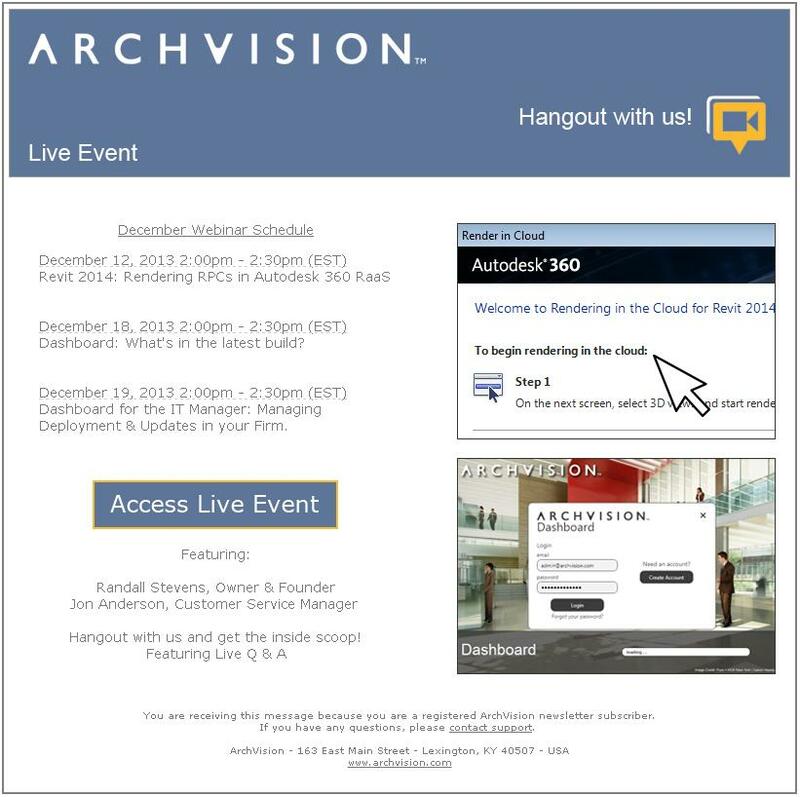 View it here: http://archvision.com/live #A360 #AU2013 topics.